The first ever retrospective of the work of the 19th-century landscapist Thomas Moran is on view at the Gilcrease Museum in Tulsa, OK, February 8-May 10. It brings together more than 120 oils and watercolors from all phases of his career. Orgainzed by the National Gallery Of Art, Washington DC, in association with the Gilcrease The Thomas Moran Exhibition travels to the Seattle Art Museum, WA, June 11-August 30. A 400-page catalog published by the National Gallery in association with Yale University Press accompanies the exhibition. 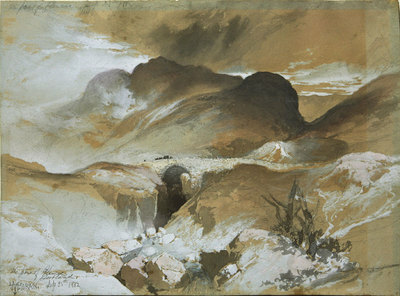 Thomas Moran, The Pass at Glencoe, Scotland, Mixed Media, September 25, 1882, 10" x 14"
Thomas Moran’s rhapsodic landscapes of the American West, which provided many 19th-century Americans with their first views of the nation’s new Eden, depicted a region of breathtaking beauty and unlimited natural resources. In painting these images, the English-born artist helped shape the country’s enduringly romantic vision of the West. Building on the traditions of Thomas Cole, Frederic Church and the Hudson River School, and Albert Bierstadt, Moran (1837-1926) is considered by many to be the last great artist of the national landscape. Moran grew up in Philadelphia, PA, and after a brief apprenticeship with a wood engraver devoted himself to a career as a professional painter. He developed his skills on sketching forays into the forests around Philadelphia. Moran’s early paintings-such as THE AUTUMNAL WOODS (1865), which show a Byronic figure in an expansive Philadelphia park – were strongly influenced by the writings of British critic John Ruskin and by the Pre-Raphaelite artists, who portrayed nature in meticulously detailed, brightly hued images. Moran’s most ambitious early picture, CHILDREN OF THE MOUNTAIN (1867), which appears to be a Bierstadt-like view of the Rocky Mountains, was a purely artistic invention: When he painted it, Moran had never ventured west of the Mississippi River. Four years later, however, Moran used the painting as collateral to help finance the western trip that changed the course of his career. Moran first learned of the pictorial potential of the Yellowstone region in 1870, when he was commissioned by Scribner’s Monthly magazine to illustrate a series of articles by Nathaniel P. Langford had recently seen the area with the Washburn-Doane expedition, and his account as well as sketches by two other members of the party provided Moran with vivid descriptions of the landscape. The next year Moran arranged to accompany the first government-sponsored survey of the Yellowstone area, headed by geologist Ferdinand V. Hayden. Riding the newly completed railway and then proceeding by stagecoach, the skinny East Coast greenhorn joined the Hayden expedition in Virginia City, MT. Over the course of two months, while the survey party gathered information for maps and a report to the Secretary of the Interior, Moran completed dozens of watercolor studies of Yellowstone’s hot springs, mud spots, and waterfalls. Quickly composed and loosely sketched on site, they were amplified with pencil notes about color and topography. GREAT SPRINGS OF THE FIREHOLE RIVER AND LIBERTY CAP and CLEMATIS GULCH are among the original 1871 field sketches borrowed from the collection of Yellowstone National Park for the current exhibition. These studies formed the basis for a series of exquisitely painted watercolors that Moran created in his studio back east for an English patron, William Blackmore. The Blackmore watercolors, now owned by the Gilcrease Museum, include THE YELLOWSTONE RANGE, NEAR THE CROW “MISSION,” TOWER FALLS, and THE GRAND CANON OF THE YELLOWSTONE, all of 1872. By this time the artist was signing some of his works TYM, for Thomas “Yellowstone” Moran. Shortly after the expedition, Hayden and others began promoting the idea that the Yellowstone area should be set aside and protected as a national park. Since no member of Congress had seen the region, Hayden and his colleagues brought Moran’s watercolor sketches to Capitol Hill, along with panoramic photographs that had been taken by William Henry Jackson (1843-1942), the group’s photographer. The eye-popping colors and grand vistas of these images that documented the wonders of Yellowstone were instrumental in persuading Congress to designate it as the first national park in 1872. Appropriately, the current exhibition coincides with the 125th anniversary celebration of the park Moran helped create. After weeks of lobbying by Moran and Hayden, Congress soon appropriated $10,000 to purchase Moran’s immense oil entitled GRAND CANYON OF THE YELLOWSTONE (1872)– the picture that established his reputation. On a canvas measuring 7 by 12 feet, Moran created a composite vista of Yellowstone Canyon, its distant falls surrounded by astonishing golden walls. It is a tour de force by a brilliant colorist applying Turner’s daring palette to the stupendous scenery of the American West. To underscore the magnitude of the scene, Moran placed a small group of figures – including Hayden and himself – in the foreground. The first landscape acquired by the federal government, it was installed in the Capitol and hailed as a masterpiece by both critics and the general public. Two years later, following an expedition to Arizona’s Grand Canyon with a survey party headed by explorer John Wesley Powell, Moran completed a companion epic of equal size entitled CHASM OF THE COLORADO (1873-74). The richly complex image is part evocation of Dante’s Inferno, part geologic textbook. Following carefully staged public exhibitions and discreet lobbying, the canvas was also purchased for $10,000 by Congress and displayed in the Capitol. Then in 1874, after seeing photographs of a Rocky Mountain peak with a cross of snow on one side, Moran trekked to Colorado to make field sketches for his third monumental western landscape, MOUNTAIN OF THE HOLY CROSS (1875). As photographs in the exhibition document, Moran reconfigured the actual terrain, adding “holy” water cascading over a dramatic waterfall in the foreground. It is not clear whether Moran tried to sell his third epic to Congress, but he did seek to exhibit the trilogy at the Centennial Exposition in Philadelphia in 1876. Congress, however, refused to loan two paintings from the Capitol, so MOUNTAIN OF THE HOLY CROSS alone was displayed in Moran’s hometown. Intended by the artist to form an awe-inspiring western triptych, the three great landscapes are seen together for the first time in the current retrospective. On his first trip to Yellowstone in 1871, Moran had passed through another dramatic landscape with which he also became closely associated: the Green River Valley of Wyoming. Once frequented by Native Americans and fur trappers, the area later came to include a railroad terminus. By the time Moran stepped off the train, a burgeoning riverside town existed with a hotel, schoolhouse, church, warehouses and brewery. In depicting the scene, Moran erased all signs of commercial development, focusing instead on the stark grandeur of the castellated buttes lining the river in bright, almost surreal hues. Rather than railroad tracks, he showed Indian caravans in the foreground – nostalgic reminders of earlier life in this spectacular setting. Moran’s mythic landscapes of the Green River locale were so popular that he executed some 40 canvases on the theme over the course of 30 years. GREEN RIVER CLIFFS, WYOMING (1881) was sold in 1994 at Christies in New York for $2,752,500. By 1876 Moran had established himself as a leading landscape painter, rivaling German-born Bierstadt (1830-1902). The two artists competed for patronage and congressional favor for years. Bierstadt, whose romantic vistas took even greater liberties with reality than Moran’s, painted exclusively in oil; Moran, on the other hand, became a master of watercolor. Over the course of a half century, Moran returned to his beloved West frequently, often visiting the Grand Canyon and Yellowstone and producing fresh images. Later pictures reflected the tourism his paintings helped launch. GOLDEN GATE, YELLOWSTONE NATIONAL PARK (1893), for example, shows the road that was built to make the area more accessible to visitors. BRIGHT ANGEL TRAIL includes a group of tourists riding up a popular trail, while another group has pitched a tent in the center of the painting. Nearly 25 years after a mountain in Wyoming’s Grand Teton range was named in his honor, Moran created THE THREE TETONS (1895), an idyllic oil of the splendid peaks, which he once called “perhaps the finest pictorial range in the United States or even in North America.” This compact picture now occupies a prominent place on the walls of the Oval Office in the Clinton White House. The 1899 death of Moran’s wife, artist Mary Nimmo, was a great blow to the painter. He sought solace in the West, traveling the next year to Shoshone Falls in Idaho. At the time the waterfall, known as “the Niagara of the West,” was a magnificent sight. Perhaps as a tribute to Church’s celebrated painting NIAGARA, Moran pulled out all the stops for his last panoramic western landscape, SHOSHONE FALLS ON THE SNAKE RIVER (1900), which measures 6 by 12 feet. He created a grand depiction of water pounding over the great falls under foreboding skies. Soon after Moran visited the sire, an extensive irrigation project siphoned off the Snake River, reducing the mighty flow of water the painting immortalized. When shown back east, SHOSHONE FALLS won some praise but was berated by critics who had seen enough of the grand and panoramic in nature. Moran never again attempted painting on such a large scale. Blessed with energy and good health, Moran continued to travel and paint well into his 80s. He and his daughter Ruth spent many winters at El Tovar Hotel in the Grand Canyon, where the views inspired the small but panoramic A MIRACLE OF NATURE (1913), painted when Moran was 76. Stephen May is a freelance writer in Washington, D.C.